Surfing is an exciting action sport that involves many moves and tricks. After surfers learn the fundamentals of surfing – trimming, popping up, duck diving, and paddling – they advance to learn the more sophisticated and complex wave riding moves. Surfing moves and tricks are there for all the experience levels. Surfers can’t move to the intermediate stages without being able to navigate the surf line and bottom turn. So, before doing the more complex moves, surfers should improve and perfect their basic surfing skills, train their footwork, learn reading the waves, and watch other surfers the way they land or complete the most complex maneuvers. Bottom turn is surfing’s most important maneuver. It is considered as the basis of surf riding by many since it’s the first turn over a wave after a surfer drops in. Carving lets you change your direction and line in the open sections of waves. While doing this move, surfers put their power and weight on the rail of the surfboard. Surfers bury the surfboard rail in water, create an arc, and remain in the curl. Another chief maneuver in surfing, cutback lets surfers reduce their speed when needed. This movement takes you back from shoulder to the wave’s pocket and repositions you in energy zone. Also referred to as slash, the snap is a radical trajectory change on top of or in the pocket of the wave. When abruptly performed, the move generates flashy, spectacular buckets of spray above a surfer. This move is a top turn vertically where surfers attack a steep slope, project half of their surfboard off the lip of the wave, and drive it down dramatically towards the wave’s bottom without losing momentum. This is one among the most popular and most beautiful surfing maneuvers. Roundhouse cutback is performed usually in small waves that don’t have much wall. The move lets surfers return to the curl attaining maximum amplitude and speed off the top, the surf line being a figure-8. The foam climb involves the surfer getting past a closed out section, whitewater, or a broken lip, connecting the wave’s two open face portions. This is the ultimate surfing move. Having a tube ride is the greatest thing any surfer wants to experience! A tube ride involves riding the wave’s hollow part, covered entirely by the lip of the curl. It’s rare to get completely tubular waves. Inspired by snowboarding, the rodeo flip involves a mixture of spinning as well as flipping. 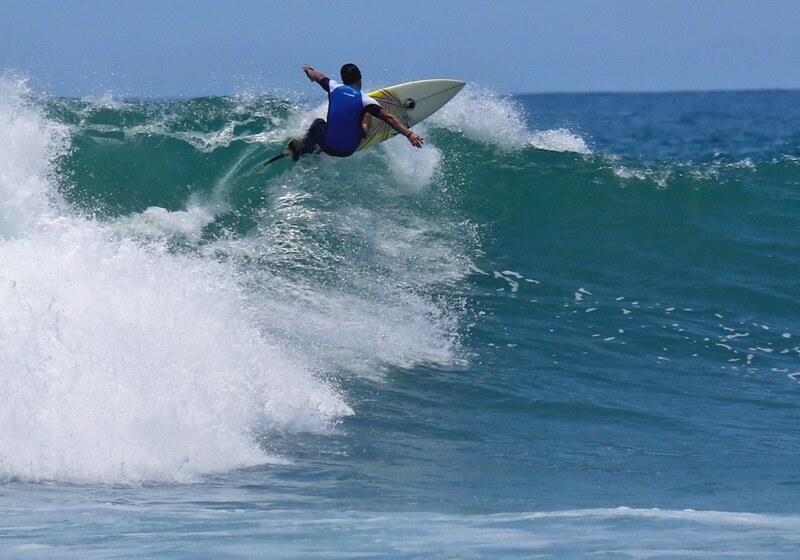 An aerial maneuver, the air move involves the surfer gaining speed, finding a ramp, launching off the lip, flying over the wave, and landing on the wave’s face or in flats. These are just some of the many moves and tricks involved in surfing. Learning each move with accuracy needs time, patience, and hard work. Surfing is indeed one of the most adventurous of the outdoor sorts out there. If you want to learn all or most of the surfing moves, consider participating in a reliable surfing camp that has experienced surfing instructors to help you learn the sport.